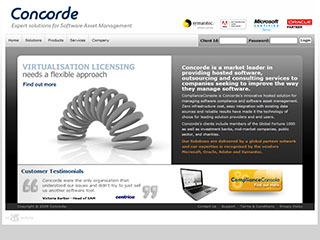 Concorde Solutions Ltd are independent specialists in Software Asset Management (SAM) and Software Compliance. They bring together market leading experience in SAM, ITIL, IS019770 and software licensing to give a holistic solution to Software compliance and SAM. They're experience covers all major vendors with a strong pedigree in Microsoft, Oracle, IBM, SAP and Symantec. The new look company website is based on the now familiar ComplianceConsole public facing website and secure customer application. With the content and structure having been updated throughout on both websites, the website is now far more integrated with ComplianceConsole.